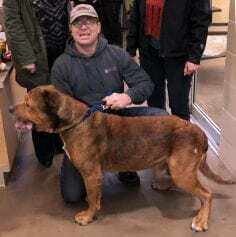 BC SPCA > News Stories > Generosity in Action: Kyle Chester, Kymar Gutters Inc. Generosity in Action: Kyle Chester, Kymar Gutters Inc. It started as a typical Thursday morning for Kyle Chester, co-owner of Kymar Gutters Inc. based out of Langley. He was driving to a job site and listening to the radio when he heard about Handsome the mastiff. Handsome had been found in horrific conditions, emaciated, cold and left outside to slowly die. Pictured above: Kyle meeting Handsome for the first time. Kyle couldn’t shake the thought of this poor dog and the pain he’s endured and immediately called the radio station and offered to pay for all of Handsome’s treatment. Handsome is now on his journey to a full recovery. Having gained a healthy and much needed 20 lbs and counting since coming into the BC SPCA’s care Dec. 21st. Kyle’s generosity has had a ripple effect. Prior to meeting Handsome for the first time, Kyle stopped by his local Petsmart store in Langley to pick up some supplies for the BC SPCA Maple Ridge Branch. 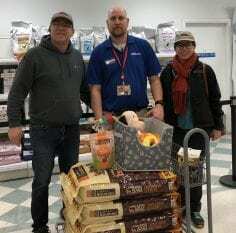 Petsmart store Manager Geoffrey McDormand (not pictured) stepped up big time and offered him two big bags of food, treats, and toys for the animals. This amazing act of kindness is something that comes naturally for Kyle. Growing up in Winnipeg, his family always gave to the SPCA, and have always loved animals. In addition, Kyle and his wife Marcela give 5% of profits from their business Kymar Gutters Inc. to local charities. When they are not at work or advocating on behalf of animals, Kyle and Marcela enjoy spending time at home with their two rescue cats. Thank you for stepping up and being a voice for animals during a time of need! For Handsome you’ve made a world of difference and have inspired many.